What an awesome birthday gift! So glad you finally got around to using it. Yes, we do need to take time for ourselves. If only the rest of the world could back off while we’re trying to do it! Cute mani/pedi, by the way. I agree, Patricia. The world should give us a break. 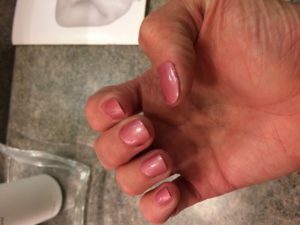 Thanks for the kind words about my mani/pedi. Congrats on no longer being a novice, Dana. I love pedicures. My 1st time was only a few years ago. The pampering is lovely. For some weird reason, massages and facials make me ill. Dehydration might be part of it. Still, for me, they are no fun. But I’m glad you had a great time. What a wonderful gift from your daughters. Oh, how awful that they make you sick, Diane. My masseuse was sure to tell me to keep drinking water afterward. Such a good reminder to take time for ourselves. I am terrible at it, but you are right — I have a drawer full of lotions I could actually use, and can stop rushing to take a few deep breaths!